46 Million Turkey dinners are expected to be served on Thanksgiving. But cooking is only half the battle. 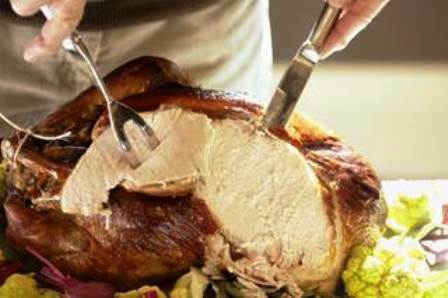 The taste can take a turkey turn downward if you don't slice your bird the right way. Dennis Snuszka, Vice President of Food & Beverage at dining destination TooJay’s Deli ( www.toojays.com ) has the must do's and don’ts to make sure you carving and serving of the feature Thanksgiving item is perfect. 1) Don’t Cut Too Soon. Allow the roast turkey to rest 30 minutes before carving. This allows all of the natural juices to redistribute throughout the meat to prevent the turkey from drying out. 3) Slicing the Right Size. Using a slicer knife use the full length of the blade to cut slices no more than a ½” thick starting from the outside of the breast and moving towards the center or breastbone. 4) Again and Again. Repeat these steps until the entire bird has been sliced. Remove the wings from the frame with a boning knife in the same way you removed the leg from the breast. 5) Boil and Go. Make sure that the turkey gravy is brought up to a boil before serving to reheat the sliced turkey.